Our son has been diagnosed with motor planning issues, low tone, developmental delays, anxiety, ADHD, OCD and sensory processing disorder as well as chronic pain. The go glider in conjunction with the You Can Ride Two program was instrumental and extremely successful in allowing him to learn to ride a bike. We saw an incredible difference in using the glide bike versus his regular bike with wheels off. · The Go Glider is lighter. We found immediately this made a huge difference. It was easier for our child to manage. It was easier for him to glide on as the weight was not an issue for him to get his momentum going, or to stop. He didn’t tire as easy, therefore his biking lessons could be longer and more successful with less fatigue. · The Go Glider bike looks cool. Why would that be important? Well it isn’t a point of oddity or of discussion amongst others of why the pedals are off his bike and his peers while he was learning to ride. It gave him the freedom to participate meaningfully with his peers while working on his skills. · It gave him great sensory input and we allowed him to experiment riding on the lawn / around the campsite / in the backyard while we weren’t practicing formally. He would have never tried that with his regular bike (for one reason because of the weight of his regular bike and for another the ease of use) And as a result created positive associations with biking and reduced his anxiety around trying new skills on his bike. · Because it has no pedals to begin with it wasn’t a point of distraction or anxiety/OCD where are the pedals. The idea of taking the pedals off was alarming and would often disregulate Carter because he didn’t like the idea of it being different. He also would then comment about how he wanted the pedals back on and the training wheels. With his glide bike it was never an issue because the bike had neither to begin with nor did it have anywhere for those components to go. · It allowed him to bike ride with his sister with less worry and stress from us because he could manage the bike more independently. · We were both impressed how his balance was so much more stable when using the glide bike, and how he was able to compensate for his low tone more easily on the Go Glider. I would like to thank you for one of the best shopping experiences. My grandson has autism and has not been able to master a regular bike (even though he wants to very much). When we came across the information about the Glide Bike, we knew we needed to try it for him. I placed my order right before Christmas, not expecting to hear anything until after Christmas or New Year's. I received a call the next day from a delightful young man who was filling the order and realized you did not have the helmet I ordered. He wanted to know if I wanted to cancel the helmet or he would trade it out for a better one at the same price. This young man was so very helpful, he even helped me decide what size I needed. Thanks to Glide Bikes and your most excellent employee my grandson got his bike for his birthday on New Year's Day......there were even lights included. You should have seen his face when he saw it, he was all smiles and tried it up and down the hallway. I feel sure that when we get it adjusted correctly to him he is going to fly like the wind. A heartfelt THANK YOU to Glide Bikes. Your bike is one of the best investments we have ever made. I have tried three wheeled scooters, 'over-sized' scooters, bikes with training wheels - all relegated to the bottom of the garden. A 11 year old girl does not want a bike with training wheels. Even without the pedals your glide bike looked like a 'proper' big girls bike. The sit up and beg riding position and the low center of gravity coupled with excellent proper brakes gave her the confidence to balance and then, today to ride a bike. My son has Down Syndrome and got this balance bike for his 7th birthday, he so much wanted to ride a bike like his buddies but steering, balancing and pedaling simultaneously was just too much for him. So last birthday he got a great Kettler pedalcar, but we had to find out that he did not have enough strength and stamina to pedal that for longer. After a lot of research on the net, I came up with this balance bike for bigger kids. He is 70 pounds and about 50" tall, so most all of the balance bikes on the market were too small for him. I am so impressed with the lightweight and the sturdy quality. I think I might just get a big one or myself!!!! Would I recommend it? I can only say, anytime. If my son can ride it and have fun with it so will any child. We have had the opportunity to use Glide Bikes at Easter Seals/UCP Preschool in Wilmington, NC over the spring and summer of 2010. Even though typically developing children enjoyed trying the Glide Bikes, children with special needs also enjoyed using them. As a physical therapist, I found the Glide Bike to be a very beneficial tool when working with young children. The Glide Bike was especially helpful for a young child with cerebral palsy. This four year old boy has a diagnosis of diplegia. He underwent surgery to release the spasticity in his lower extremities and over the past two years has undergone intense therapy for strengthening and trunk control to walk independently. The Glide Bike provided a means to not only strengthen his lower extremities by propelling the glider forward, but also worked on his balance and trunk control. 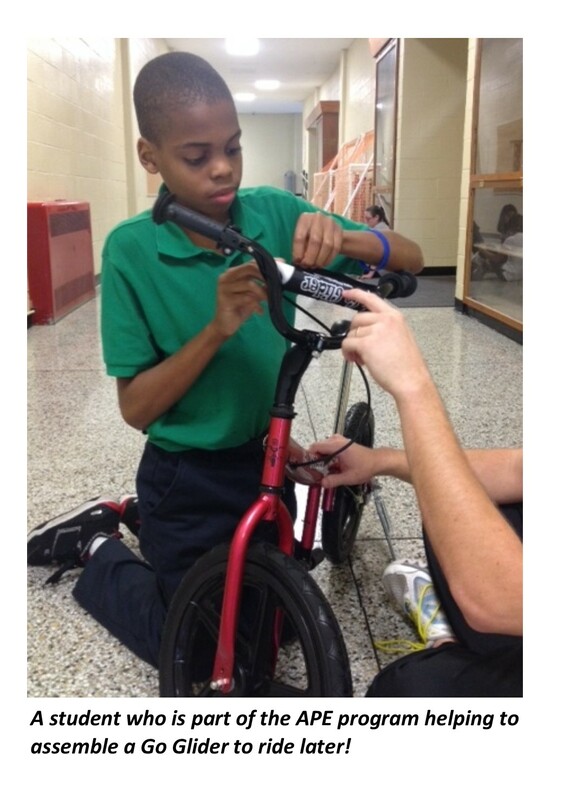 This little boy enjoyed riding the Glide Bike with assistance, attempting to propel it independently. Although he was not able to propel the glider without assist, he benefited greatly by giving him another means of strengthening/balance exercise that was fun! The Glide Bike also proved beneficial for children with a hemiparesis. Controlling the Glide Bike forced them to try to hold onto to the bike with the involved hand, and to balance and push the glider forward with both feet. This was easier than attempting to push the pedals on an adaptive tricycle since both feet were on the ground. (Guidance and assistance were needed from the therapist). I highly recommend the Glide Bike as a therapeutic tool when working with children. The Glide Bike can be used as a tool for generalized strengthening, endurance and balance activities regardless of the diagnosis. It is a “fun” way for children to perform an exercise activity. As they gain control of the Glide Bike it also increases their confidence. Check out our little helper. He knew exactly where each part went (mostly), and just needed a little help tightening up everything. He even used sign language to tell us he needed a helmet to ride! Knowing that he would get a turn on the bike led to him participating in PE without having a single negative behavior. Can't put a price on that! Lara is a special needs teacher who allowed one of her students to help with the assembly of a Glide Bike before class. Lara's class takes turns using the balance bike to help improve balance, spatial understanding, and confidence!